Well done to A Company 2 RGR on their gold medals on Exercise Cambrian Patrol and to the team from the Nepalese Army who received bronze medals on 18th October. Then on the 19th October the QOGLR team led by Sgt Chakra Rai, completed the demanding long range military patrol and were awarded awarded silver medals. And then Gurkha Company (Sittang) also achieved gold a few days later. 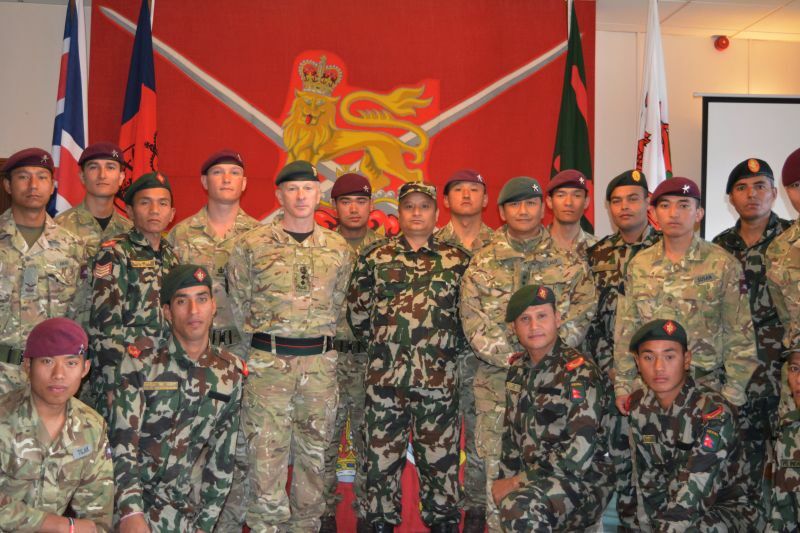 The Nepalese Army team have been training with the Brigade Training Team prior to the event so that the Nepalese Soldiers had the best chance of performing to the maximum of their ability, and they certainly did very well on this tough and difficult event. Brigadier A S Richond OBE, Commander 160th Infantry Brigade and Headquarters Wales and Colonel J Robinson, Colonel Brigade of Gurkhas, Colonel awarded the prizes at Sennybridge camp on 18 October 2016. 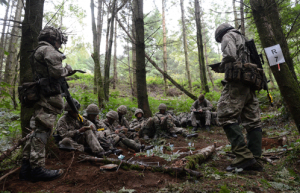 Exercise Cambrian Patrol is an annual event organised and run by 160th Infantry Brigade and Headquarters Wales. It is a world-class event that is both physically and mentally demanding and is a highlight in the British Army’s training calendar. It is a continuous 36-hour, long-range patrol exercise which is run annually within the Cambrian Mountains of Mid-Wales. It is open to all three services with regular, UOTC, Reserve and international patrols and is considered one of the most arduous and prestigious military events, testing candidates’ leadership, field craft, discipline and both mental and physical robustness. Internationally, it is regarded as one of the toughest tests the modern-day soldier can face and some foreign entrants have to claim the right to take part by winning through their own domestic competition. There are teams from Nepal, Latvia, Mexico, Canada, Italy, Georgia, Germany, Pakistan, Australia, Czech Republic, New Zealand, India, Ireland, Bosnia and Herzegovina, Belgium, Chile, Kosovo, Brazil, Switzerland. 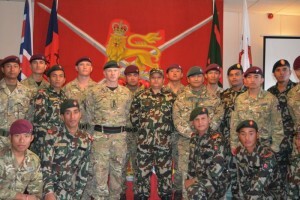 On the 20th October the Nepalese Army Cambrian Patrol team visited HQ Brigade of Gurkhas. They were welcomed by Major Dammarbahadur Shahi (SO2 Personnel & Policy) on their arrival. Where upon they were taken to the conference room for a brief about the current news of the Brigade from Captain Lalitbahadur Gurung (Queen’s Gurkha Orderly Officer).